A festschrift is a specialized history: a collection of tributes and articles, usually created for a retirement or career milestone. The best of them are (1) wide-ranging, containing a multitude of voices; (2) honest in a behind-the-scenes way; and (3) contextual, in that they recognize the honoree’s achievements within the larger scope of his or her organization and field. Festschrifts began in academia but they are also a subset of corporate history, making appearances on About Us pages and at many a company founder’s retirement dinner. 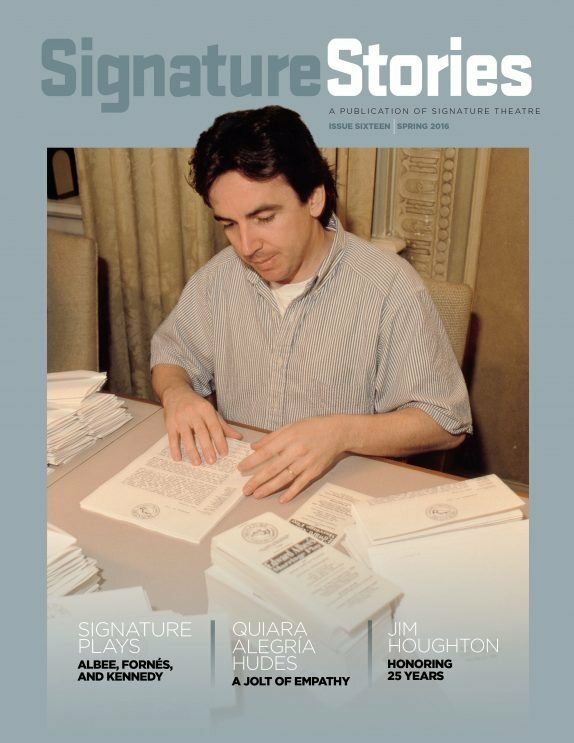 One of the best (and most poignant) I’ve seen recently is the Spring 2016 issue of Signature Stories, published by New York’s Signature Theater in honor of its founder Jim Houghton. It was published a few months before Houghton’s death. Compiling and editing such a collection is rarely easy: many people promise to contribute, but some will drag their feet and a few will not come through at all. At least the latecomers can be offered space on a website or private Facebook page (Signature added many tributes here). Both in print or online, the contributions have to be balanced and sensitively edited. Having helmed a few festschrift projects myself, my advice to editors is to be both diplomatic and disciplined. And to art directors: be prepared to comb through boxes of old photos if the organization lacks formal archives.